Siemens Gamesa will implement their life extension program on 264 turbines with a capacity of 237,5 MW in Spain, thus extending their useful life by 10 years. Siemens Gamesa Renewable Energy (SGRE) will implement its life extension program on the entire operating fleet of one of their Spanish customers, consisting of 264 wind turbines of different models with an average age of 15 years. The turbines are located at six wind farms in the provinces of Zaragoza and Teruel and have a total output capacity of 237.5 MW. This will increase the availability of the turbines until year 30, extending their estimated useful life by 10 years. The Life Extension program consists of monitoring and structural upgrades and provides greater control over operation and maintenance costs and streamlines the cost of energy. "This contract demonstrates the trust placed in us by our customers and the added value of our services. 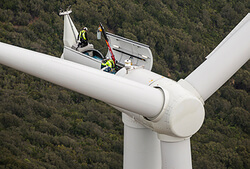 Our company has been in charge of the maintenance of these turbines since they were installed and we will now implement enhancements to extend their useful life until year 30, adding 10 years of income,” said John Paul Larrañeta, Service CEO of Siemens Gamesa’s Southern Europe and Africa region. Siemens Gamesa signed a 69 million euro contract with Bosnian utility EPBiH to supply wind turbines for a planned 48 MW wind farm.